Ring billed or Herring? Shot in Maryland this week. Thanks. This'll be interesting. Kudos to those who consider this an easy call. Jumping in here, for better or worse, based on this one photo I would say Herring. The bird and bill look stocky to me, even though without a size reference to gauge that's not that convincing. Bill size and shape can also play tricks due to photo angles. 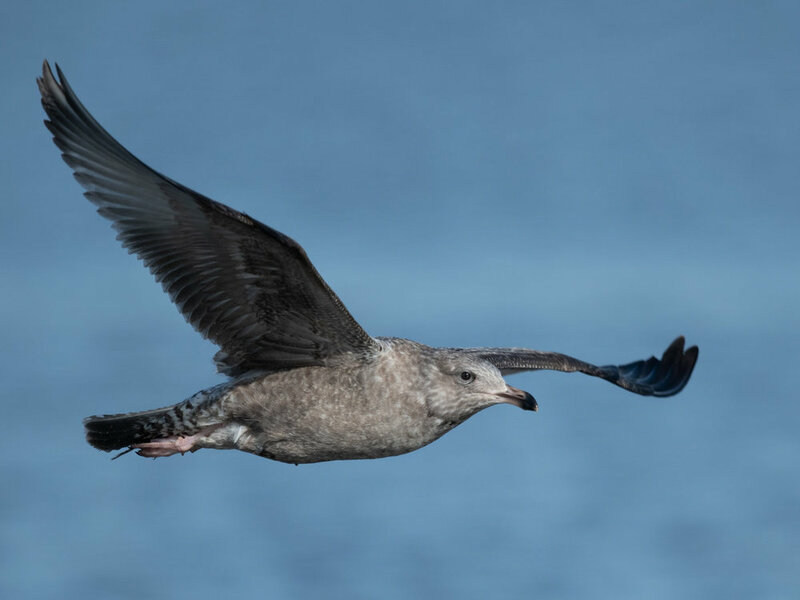 One thing we can say for sure, this must be a first-winter gull. 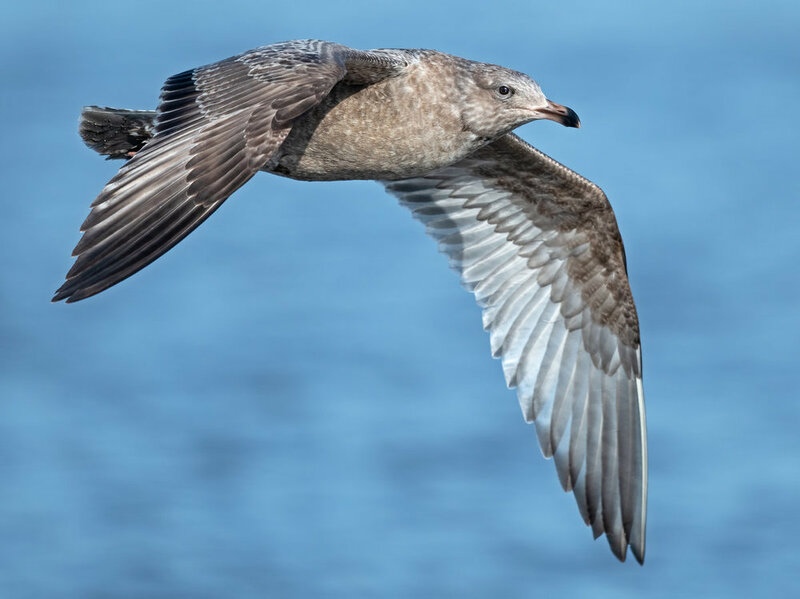 And at this time of year, late winter, I would expect a Ring-billed to show a little more white in the underparts plumage and less of that murky, brown-gray checked look. That clinches Herring for me here. I'm not good with gulls... BUT... I do like these challenges for me. Went to eBird and looked at bar charts of Maryland and then restricted my search to Feb-Feb during the last 18 years or so to see what's most likely now and looked at each species. Also compared ID marks on All About Birds and I'd very much agree with the comments above about why they'd lean towards herring. The shape of the bill, the overall color... All About Birds mentioned dark primaries and a dark tail band for the juveniles and that seems(to my untrained eye) to look good here. I wouldn't mind other views of this bird to see other details such as the legs but I must note that this is a great photo to use for comparing details. I cannot photograph gulls in flight well... MOST of the time anyway. Poor camera and poor camera skills here. I think I can see tip of a pink toe which would lead me to think Herring over Ring Billed but not sure if foot color at that age is a reliable marker? This is a first or second cycle Herring, I'd lean second. Bill and body structure of Ring-bills is smaller and thinner, and overall much less bulky and heavy. Ring-bills have pink legs as first cycles, but this bird is much dirtier then any first cycle Ring-billed would be, and again the structure is different. Thanks everyone for looking at this. Here is another unedited of the same bird showing the underside a bit better. Also a photo of another bird that it was with feeding. Also there were a ton of Ring Billed adults there. Not sure about the gull, but awesome photos! Agree with Herring Gull here...probably 2nd cycle. Structure , size and bill would be smaller in Ring-billed. 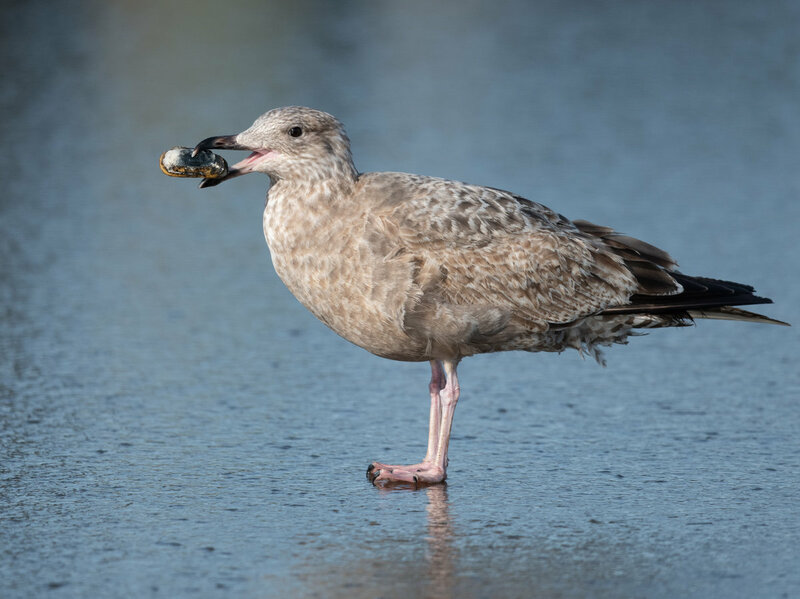 This is a 1st-cycle Herring Gull (not a juv, as it's replaced some juv plumage). The bill pattern is perfect for a late-winter first-cycle bird and, more telling, the outermost primaries are quite pointed; older outer primaries are wider and rounder-tipped. Additionally, a 2nd-cycle Herring would show at least some indication of adult color and pattern by Feb of its third calendar year. Ring-billed Gull is right out, as it would have little or no brown aspect to the plumage in its first winter. That age of Ringer also has a strongly bicolored bill -- black tip, pink base and has extensive gray on the back and wings. The field guides do treat these well and are to be trusted.